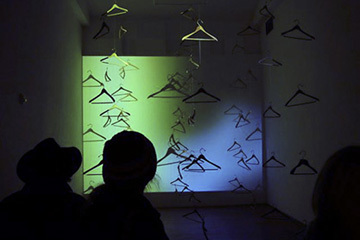 filled with a floor-to-ceiling, three-dimensional grid of wooden hangers. The installation presents artifacts of one individual’s identity, starkly isolated, pointing to the questions raised by the finite nature of our lives. Contrasted with this are rhythmic, repetitive and soothing moving images highlighting the infinite nature of the eternal.